This article’s purpose is not to define what constitutes “primitive” in languages. There is, however, a great difference between modern and tribal languages. The languages of tribal peoples reveal they do not think in abstract. There is no such thing as “classifications” to them. The Baikiri of the Amazon are a classic example. They have a name for every type of parrot and palm tree there is. But they have no name for the genus parrot or the genus palm. There simply is no classifying. They have far more words than we do, but no words that reflect classification. The most “primitive” languages are incredibly complex, but they are descriptive, not abstract. White Man pops up and notices this. He classifies the lack of thinking in abstract as more primitive. But it is a truth than when it comes to descriptive, modern advanced languages are not as complex. Language reflects thought. We don’t think in details. Perhaps we think too much in abstract? Anyway, the point here is something quite serious for Bigfooters. Yes, sorry True Crime guys, but I pursue the truth here even in this topic. Recasting Bigfoot put much in order supporting the Indian tribal statements regarding two tribes of Sasquatch Men. Those who just read titles and only classify were aghast I wrote about this topic. Figure the verb “recasting” in there and you’ll understand why I am The Most Hated Man in Bigfootery. In any case, one thing I didn’t touch on in Recasting Bigfoot was the attitude of tribal people NOT to classify. Logic and comparative analysis of many journals and sightings underscored the truth of what the Indians had told the Whites. But most Whites, especially those Bigfooters who came later, did not understand the attitude of such people and how it expresses itself in the mechanism of language. The Indian tribes of the Pacific Northwest, despite being very international in outlook, did not think in abstract. They thought in descriptives. When every tribe spoke of different types of people and animal-like humans in the forests, they meant it. And they were more qualified than the Whites, who tended to classify. They noticed more distinctions, since they thought along the complex lines of describing everything as distinct and unique. When the Salis Indians told J.W. Burns, the Indian agent, of the “Sasquatch Man” they were careful to say there were two tribes. For them to say this meant a lot. This meant that there were two distinctly different kinds of Sasquatch men, but they were very similar. 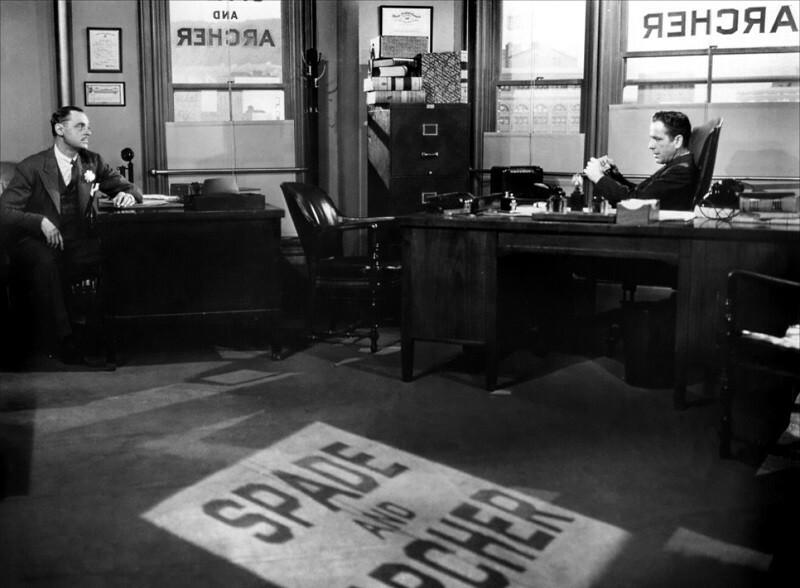 One could speak something akin to Douglas. One was more animalistic and could not speak. Both were around 6.5 feet tall. This was Sasquatch Man. They existed amongst other strange hairy men and animals in the forest. But J.W. Burns was a White Man. He tended to classify. He took “Saskahaua George” (pronounced Saskahaua Chotch) and reduced it to Sasquatch. Fascinated by the stories he told, more Whites took interest. Soon Sasquatch was the sole species out there, the giant hairy Indian turned into a charming folklore. Over time Whites reclassified and Sasquatch became Bigfoot, a giant bipedal North American Ape. Yet none of this was based on the meticulous descriptive minds of the Indians. There were two tribes of Sasquatch and one was human. Dividing them, they seem to be a human and an anthropoid very similar. Indian artwork bears this out. The Indians also described the Dsonoqua, which was not a Sasquatch; Skoocoom, too, appears to be different. I’m not going to go over the thesis of Recasting Bigfoot here. The point is that when Indians made such careful distinctions they were reflecting the dominant trait in all tribal languages: a complex ability to divide and describe between minutiae. It is something that developed languages don’t display, though some vary. For instance, English is much better describing tenses of action than French, but French is far superior at describing shades of color. In like manner, the ancient Indians and other peoples were very good at describing all details of distinction. When they divided between Sasquatch and Skoocoom, Dsonoqua, and barbaric, primitive tribes of hairy men, they meant it; and far more than Whites they were capable of making the distinction. This makes that human tribe of Sasquatch very intriguing. It is so akin to some anthropoid that both were actually classified, even by the Indians, as something very similar in appearance but still different in character. 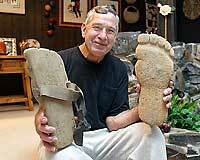 White Man and not Indians have sired the modern folklore of the single-o Gigantopithicus Bigfoot. It is a classification that wiped out the details of more than one type of anthropoid and even humans existing in the deep forests and mountains of the Pacific Northwest. The generation of Indians that still remembered has sadly died off. Their descendants have begun to think along White Man’s ways of classification. Fortunately, the tribal art of their ancestors still preserves their complex ability to describe and differentiate in details. We can still collate this art with the old stories to reveal how accurate much of the stories were. We still do not have Bigfoot captured because we seek a classification so far out that it is folklore. We are looking for a giant in the wrong place (they ain’t in Philadelphia), when we should have been looking for more than one thing, much shorter, one much more human and one much more intriguing. How to accomplish this? How to take an anemic pursuit of 30 minute TV episodes and restore the hour and a half image of old Sun Schick documentaries in the 1970s? This is the perfect comparison: Peter Graves warning people that they are about to watch the most startling motion picture in their lives compared to today’s looking for love in all the wrong hominids. Where are all the expeditions going deep into new territory? Where is the assault on the actual Saskahaua? Who is trekking to Morris Mountain? Yet this is the impression of the mainstream. They think BIGFOOT has defied discovery and therefore must all be a joke. In truth there have been no attempts to discover BIGFOOT; only attempts to capitalize on the concept of looking for BIGFOOT. The mainstream believes that BIGFOOT is a carnival creature because so many fanboys of a real life comic strip got involved and wanted and, frankly, created a BIGFOOT in their own backyards. This made BIGFOOT all the more unbelievable. This made Bigfootery all the more a joke. Very few out there remember the image of the old days– 1958-1985– when new tracks were reported by the mainstream media, when Bigfooters trampled the woods trying to find them, when a media circus ensued, where BIGFOOT most of all was in the Pacific Northwest. Who remembers the days of funded expeditions deep into the woods, of woodsmen funded by millionaires trying to find more data and capture the beast? Who remembers a symposium at U of British Columbia? Contrast this with today’s monster conventions where BIGFOOT memorabilia sits next to posters of King Kong movie releases– the BIGFOOT stuff being just as much a fantasy as those movies. In June 1978 U of BC held a symposium. When one anthropologist expounded his belief in BIGFOOT at a convention recently his peers wanted him bounced from their university. Questers and anthropologists have given way to monster lovers. Why shouldn’t the mainstream think ill of the whole pursuit? Why should any producer think of making a serious, critical documentary? David Wolper had to persuade the Smithsonian to sponsor a serious documentary in 1974, and it became the biggest TV documentary of all time, one that then inspired the granddaddy of BIGFOOT docudramas Mysterious Monsters with Peter Graves. But the image that all this helped create has long been erased by 30 years of frolic for “reality TV.” Those who pursue BIGFOOT pursue vampires and werewolves as well. Fantasy monsters, ardent fans who love the old Universal horror movies and now want to be an armchair Helsing. Those who forsake the armchair do so only to prove the past. Expeditions today try and find the exact location of where Roger Patterson filmed his “Bigfoot” in 1967. Some try and recreate the walk and stride of the Bigfoot in the film for yet another “reality” camera watching them. Others go on a digging expedition to find where the cabin was situated at Mount St. Helens in 1924. All well and good, but this is more tourism and relic hunting. It is not following a new trail. Where are the encounters with BIGFOOT? I mean the new ones in the last 35 years? None. Where are plaster casts of new prints? None. Where are the stories of going deep into the woods and encountering anything unusual. Few and very questionable. There is little reason to have respect for the modern pursuit of BIGFOOT. This, however, blind sights the mainstream to the truth that such real and new Bigfooters are out there, that new ground has been combed, that new expeditions are coalescing. A new era is coming, one of more encounters, more deep woods pursuits, and one where expeditions will travel deep in with plenty of equipment to try and add more data and finally ignite a respectable pursuit back into the deep and dank woods of the most mysterious place in North America– the Pacific Northwest. Too many have been motivated by Recasting Bigfoot not to believe that a genuine native American anthropoid exists, and that more than one type forms the backbone of frontier accounts of encounters with “animal humans.” To make the new era that is dawning poignant and relevant, let us restore respect to the hunt for BIGFOOT. It is not the hunt for a Facebook meme or Halloween suit. It is the hunt for truth. Legends have long spoken of a “hairy, giant man monster” of the PNW. Indian artwork has admirably reproduced features exclusive to South American primates. Old accounts vividly describe encounters in the PNW with what old Spanish accounts describe as existing in South American jungles. It is time to put away the comic book and take up the substance that inspired the anemic and self indulgent era that has dominated the pursuit. It is time to don the scotch flannel plaid shirt, the thick rimmed glasses, and tread deep into the woods of the Pacific Northwest. Let’s look at a few key points of topography that will help us understand the PNW. It’s that time of year again. The holidays approach. Snow is coming. It’s the time of year in which we forgive all ruglizards for their ruglizardry. BIGFOOT season is now over. Always at its height in October, the season is marked by Bigfooters going out to partake of the woods or, more likely, to contemplate the days when this was done. Sadly, it has become a time to contemplate the past, but not to advance into a believable future. BIGFOOT is the hairy nebulous chimera of the Pacific Northwest of Canada and the United States. But because 150 years ago some old frontier reports declared some vision of a hairy manlike creature in Arkansas, New Jersey, or wherever, the pursuit has become one over the whole continent and not in the PNW. There are those who still seek “BIGFOOT” everywhere, including under their grandmother’s sofa in Pittsburgh. Is this the result of credible analysis? The pot of controversy has never boiled over. It has not for a very good reason. No one wants to turn the heat up. You know why? There is only one way to do it: major expeditions converging and rivaling for turf. This is not Bigfootery, but it will be the New Bigfootery. Why? Because New Bigfootery has a believable goal. In substance, Bigfootery doesn’t even really exist. It is an audience still applauding an old performance. It is something to do until the aisles clear. It began in the deep woods of the PNW. Hoaxes dovetailed on old stories of the “Kangaroo Man.” Old journals repeatedly spoke of a hairy “animal human” or giant (7 foot tall) manlike animal. People went in search for the truth, but never excised the hoaxed elements from the developing montage. Today, Bigfootery is an armchair pursuit regurgitating past narratives, obsolete and without foundation. It has become holiday searches into boondocks that aren’t within asteroid strike of the right locations (Pacific Northwest). Theories are hobbled without any analysis to contradictory evidence. It is a pursuit purely of those who fell in love with a narrative set in stone in the 1970s. One can add to the narrative. One cannot erase any part of it. I started erasing. I chipped away and started chiseling a new narrative. To the old this was an abomination. However, it restarted interest in thousands of others. I gave a believable form to the quest. The reason why Recasting Bigfoot and me became such a pariah is that my thesis required the substance of the glory days to return. It gave us a real goal. This requires dangerous expeditions into the heart of the PNW. It requires accepting more than one thing is involved, including humans. Most distasteful of all, it required archiving the last 35 years of comic book fascination. Hundreds were inspired by my book Recasting Bigfoot to take the subject seriously again, with a number of these ready to put it into practice both in group outings and for those in the PNW on their own mini expeditions. An old view of Mount St. Helens, home of the Skoocoom. The Pacific Northwest is still a vast, unconquered place. In terms of public knowledge PNE&S is latent, but in terms of actions it is nearing the point of taking the field openly. This means media. This means a high profile and a new profile to an old search. Now in November it is time to contemplate the goals of PNE&S and the data gathered during another season. It is the time of year for BIGFOOT for the Soul– a time to contemplate the substance and the image needed to bring about the goal. The image is a terrible one today. It is one of fanboys looking for a preposterous 9 foot tall walking gorilla in Illinois. Facebook memes show a man in a Halloween suit and the caption reads the “World’s reigning hide and seek champion.” The problem is no one has searched for the real thing in decades. The reality is BIGFOOT doesn’t need to hide and he doesn’t just gallivant across our highways. Bigfootery deserves the false impressions and cynicism of the mainstream. It has done nothing but foster it with its own false impressions of BIGFOOT. But if we bring the image of the hunt back to the original– the Rice-Burroughs novelette world of seeking the land that time forgot, it becomes an exciting, adventurous, and even at times an erudite pursuit. As this chilly November progresses, I will post some of the evidence for the truth behind the real BIGFOOT, not the garish object of some monster quest. You can also get Recasting Bigfoot at your local booksellers or online. It resets the foundation. It makes it all easier to communicate the rest of the information. In its heyday it was OK to hunt Bigfoot. Bigfoot was Yeti, and the most respected anthropologists in Britain and America believed Yeti was a Gigantopithecus. A real survivor of a primeval time was still around, and this made it all an acceptable hunt. Gigantopithecus was real and therefore Bigfoot could be real, despite the topic being surrounded by what was viewed as redneck machinations. As Bigfoot evolved in the hands of hopeful Bigfooters, he became less believable, less animal and more some comic apeman that seemed inspired more from popular TV and novelettes. Most scientists bailed, shouldering the possibility that Bigfoot was Gigantopithecus or something close. The Patterson Film finally did it in. It gave us a buxom but otherwise confusing chimera of the Pacific Northwest that didn’t match anything the old journals had spoken about, nor did it resemble anything the Indian tribes had mentioned. Society, however, latched onto an image that could crystalize the pursuit. This became Bigfoot. A single species, a cone headed apeman/gorilla. But shouldering a theory doesn’t mean putting it away. You carry it with you, always on your back, always ready to unpack it when the time comes. It is at this juncture that we find ourselves again. I unshouldered the pack again and pulled out Ameranthropoides Loysi. In Recasting Bigfoot I showed all the evidence suggesting that part of the legend of “animal humans” in the Pacific Northwest of the USA and Canada is based on the existence of a native American anthropoid. Bigfootery was aghast. Zoology and anthropology were not. Even former humbugs of Bigfootery acknowledge there were serious field researchers now. The substance behind the new Bigfootery is not high profiled. The horrid narrative of cheap monster quests still dominates the ether. It remains secretive because all Bigfooters guard their turf. It is as Jack W. Ondrack declared at the Western Society of Sociology and Anthropology in Banff. They are out! I gave you all a head up about Jean St. Jean’s new releases of Cryptos. He is a renowned sculptor, having made many of your favorite action figures and collector statuettes. He’s worked for DC, Marvel, Diamond, McFarlane, etc. He formed his own company CreatuReplica to market his own sculpts of his favorite pastime– cryptozoology. Jean credited me with inspiring him to get back into Bigfootery with my book Recasting Bigfoot. My analysis of the whole phenomenon led me to believe that much of it is inspired by native American anthropoids. For the first time people can now own a 9 inch tall Skoocum based on that theory. He even comes with a Platyrrhinnian nose! As most of you know, Bigfoot, for all of the corny image it may now have, is the only real fun quest I have amidst all my others as The Quester. There’s no murder, disappearances, mourning families, and hours of report reading. So this gesture on Jean’s part means much to me. He even signed them! I also have Skoocum before it is even officially out! I think if this run is a success Jean may have some more exciting offers for the Crypto buffs out there. It was northern California 1958. The year before the Hammer film The Abominable Snowman of the Himalayas had done well over the silver screens and was still in theaters. It was the ultimate Yeti film. It gave us towering monsters we never really saw clearly. We knew them by their huge footprints in snow. In August around the lumber roads of Bluff Creek, California, north of Willow Creek, big footprints appeared at night. Each morning the lumbermen came to their tractors, earth movers and dozers only to find big human barefoot footprints impressed in the chocolate colored mud all around. Two different types were found. One was a big fat enlarged human print. The other was a funny hourglass shaped print with a pointless groove in the ball of the foot. Left, the enlarged human print. Right, the “Hourglass” print. Drawings taken from casts. No one knew what to make of it. A little digging uncovered some old west stories of some Kangaroo Man who used to terrorize folks in the nearby Sixes in southern Oregon and northern California. The stories weren’t clear. He was hairy all over and a human monster. The last newspaper reports of him were about 60 years before at the turn of the century. Was this a big Indian or some wild renegade? No one knew, but it finally got coverage in the AP and local Humboldt Times in early October. The owner of the feet was declared to be BIG FOOT. That seemed accurate enough. Well, it was a great story. The Humboldt Times dug up more stories. The Kangaroo Man was referred to, of course. Other stories came out, and finally it was declared that if “Big Foot” was a big Indian he was hurting no one. He was merely inspecting the equipment. There were some stories of Bigfoot “temper fits,” naturally. 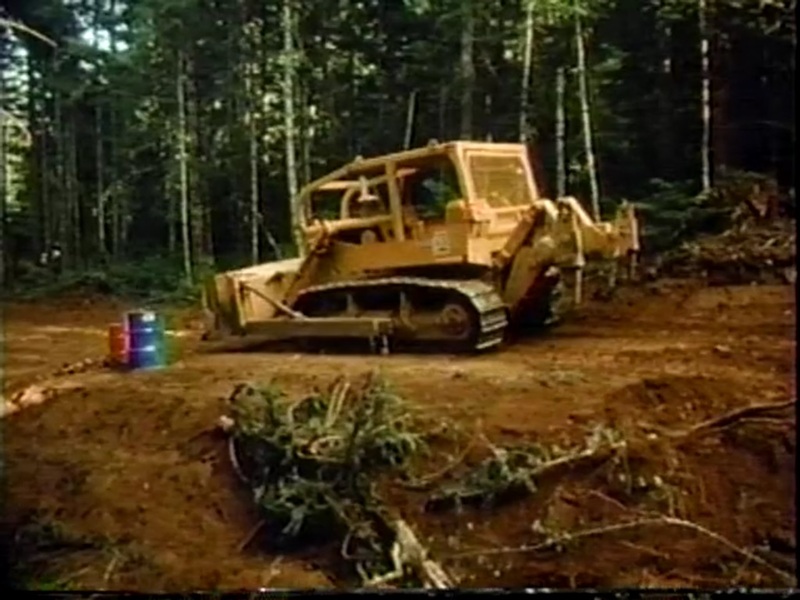 Bigfoot threw gas cans, earthmover wheels, even culverts. Though it made the national news, a lot of that stuff was giggled at locally around Willow Creek, the center of the logging industry in those parts. What all this came down too was this: some big footprints, of 2 radical different kinds, had been found around the lumber roads. The most beneficial information that came out of it all was the uncovering of old stories of a wildman or Omah, as the Indians called him, that used to howl and whistle, was hairy all over, had long arms and big feet. However, such a thing was last heard of 60 years before. The Canadians naturally associated “Big Foot” with Sasquatch, but Sasquatch too was a pretty nebulous entity in 1958. Had British Columbia not been celebrating its centenary, Sasquatch would have been forgotten there too. In preparations for the upcoming festivities, Sasquatch had become a big deal in anticipation of using it as a cultural symbol. In the couple of years preceding, this interest had brought forward reports that described seeing something like a hairy “Yeti,” the big thing in world mysteries in the 1950s. The creature Roe saw, as drawn by his daughter Myrtle Walton. There is nothing Yeti about it. Soon a local Canadian journalist, John Green, would become crucial in getting the new image of the Sasquatch in print. He was one of the first to publish the William Roe sighting, which had occurred in October 1955 on Mica Mountain in the Canadian Rockies. When the Province ran its article in October 1958 on “Big Foot” Green took an interest in Bluff Creek. Later he and fellow Canadian Rene Dahinden got involved in Tom Slick’s expedition there to uncover the truth of “Big Foot.” It was clear that the theorizing on Yeti was already forming the image of Bigfoot. Yeti had reigned as the world’s premier mystery in the 1950s. Tom Slick had already spent a lot of money trying to find the Yeti in the Himalayas. Now as he formed his expedition, American newspapers announced that “Slick Thinks Big Foot Kin of Abominable Snowman.” Green and Dahinden helped foster the idea Sasquatch and Bigfoot were one and the same. Altogether the image of Bigfoot and Sasquatch took form as a Yeti. The Shipton Photo (1951) of the print believed to be of the Yeti placed the Yeti as the chief mystery of the 1950s, but the print doesn’t match anything ever found in America. Another early Bigfooter helped foster the association that Bigfoot and Sasquatch were the same thing. 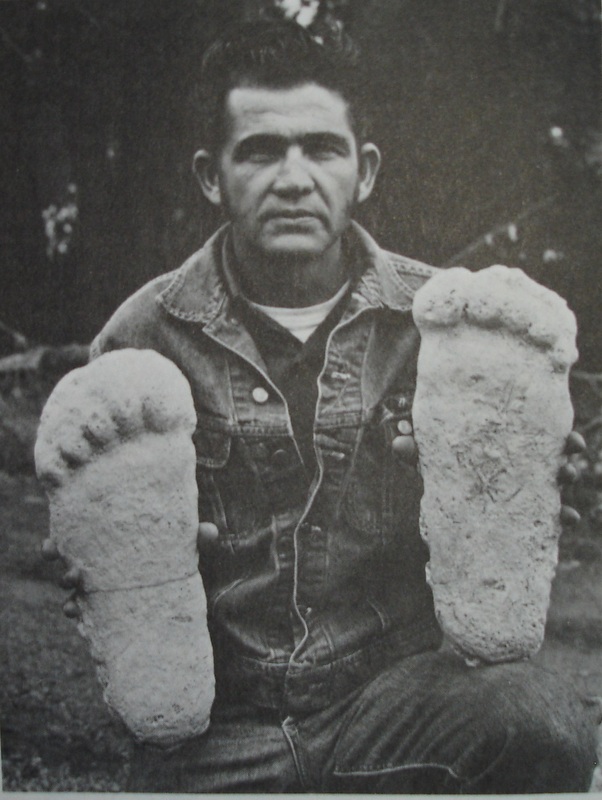 Bob Titmus had been in on Bigfoot from the beginning. As a Redding, California taxidermist, he had been the one to whom the lumber men had asked about identifying the print. Titmus drove to Bluff Creek but realized this was no known animal. He taught them how to make the plaster casts. Green would later develop a working relationship with him. In the process Titmus had seen Green’s tracing of the Ruby Creek Sasquatch print. He sent Green a tracing comparison of the print that Jerry Crew had found at Bluff Creek (Crew was the first to cast a print). Put together the tracings looked near identical. In reality, Titmus’ drawing was an enormous artistic fib. The print that Crew cast was that of an enormous flat human foot. Green’s tracing was of some strange, elongated humanoid foot with toes that were almost even across. 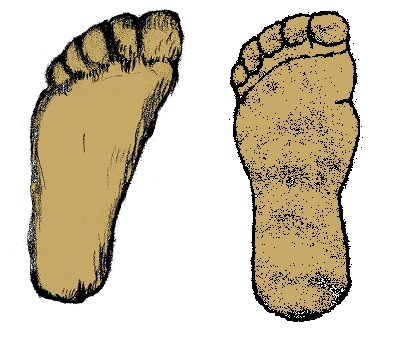 When Titmus drew his comparison he stretched the small toes on his tracing of Crew’s cast to make it look, in outline anyway, almost identical to the Ruby Creek Sasquatch print. This artistic lie clinched it for Green. Bigfoot and Sasquatch were one and the same. The comparison made on page 26 of Green’s original On the Track of the Sasquatch, 1968. Jerry Crew holding the actual cast that Titmus claimed to have traced for Green. It is clearly an enlarged flat human foot. In Titmus’ “tracing” he stretched the small toes to match the Ruby Creek print, falsely indicating a similarity. 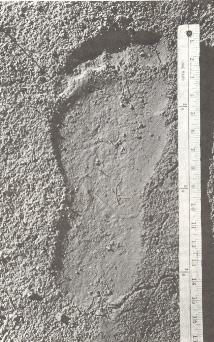 In short, Bigfoot’s footprint at Bluff Creek is neither the Sasquatch foot as traced at Ruby Creek (1941) nor is it the Yeti print as photographed by Eric Shipton in 1951. If all these prints represent the actual stimulus of the legend, then at the very least Yeti, Sasquatch, and Bigfoot are not one and the same thing and, indeed, from the prints they must be radically different. One of the Blue Creek Mountain prints of 1967. The footprint that Crew cast in 1958 is actually a rare one. The most common prints uncovered and cast at this time were what Dr. John Napier of the Smithsonian dubbed the “Hourglass Print.” Personally inspecting a track of these prints is what convinced John Green that Bigfoot at Bluff Creek was real. He first saw them on a sandbar in 1958 and 9 years later again near Blue Creek Mountain, near Bluff Creek. He was able to identify them as the exact print he had seen 9 years before. He would later declare these prints to be “typical” of the tracks of Bluff Creek. 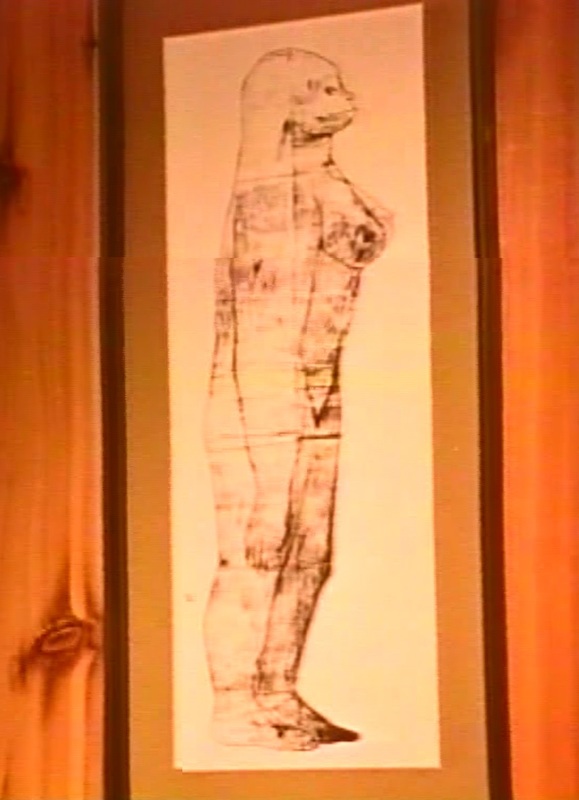 It was the interest created by these prints in 1967 that brought the old, disillusioned Bigfooters back out after the “years of silence.” It also brought Roger Patterson back to Bluff Creek and only a couple of months later he would “film” Bigfoot. 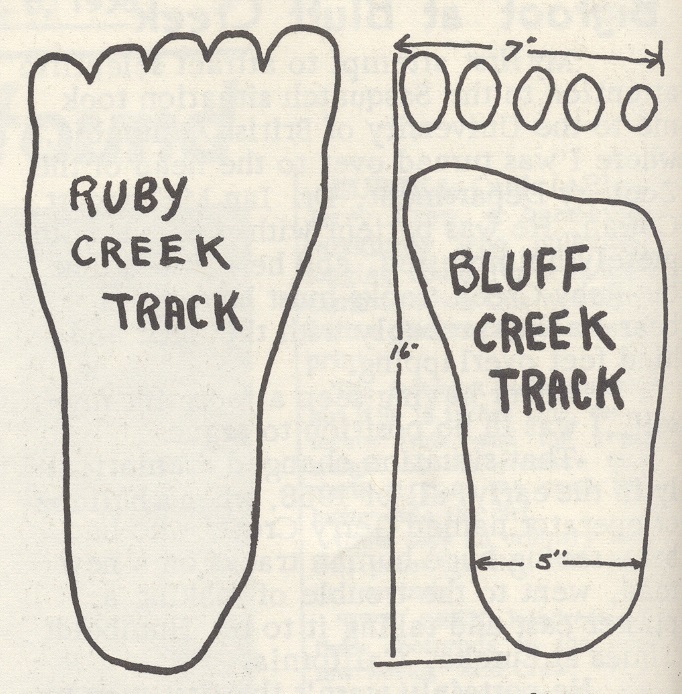 His Bigfoot would also leave different style footprints, but they were clearly inspired by the “Hourglass” type of prints so dominant at Bluff Creek. 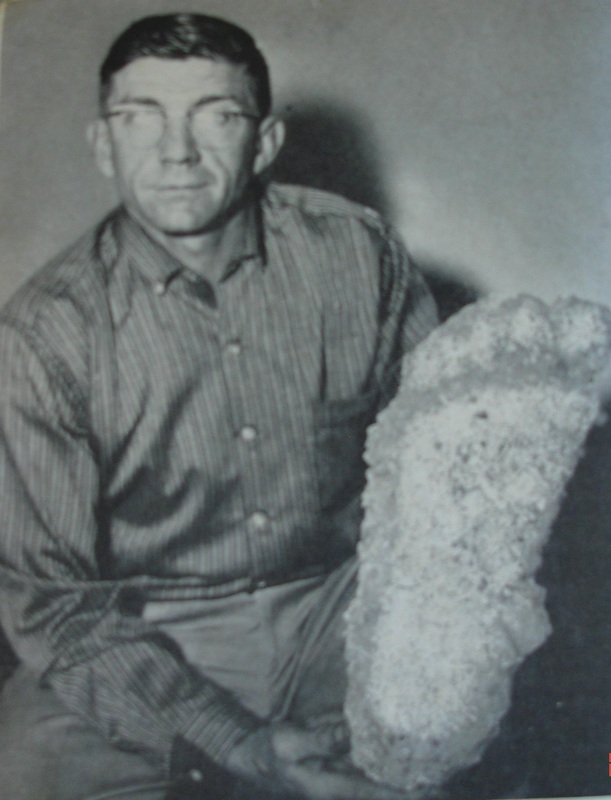 Bob Gimlin, Patterson’s partner, holding casts of the footprints, left and right, left by the Bigfoot in Patterson’s film, 1967. Sadly, for all of this, the origin of the footprints at Bluff Creek can be traced. Contractor Ray Wallace and his brother left the tracks as a joke to fool his lumbermen. This was vehemently denied in 2002 by Bigfooters when Wallace died and his obituary read “Bigfoot has died.” The family confessed therein that they knew Ray had been known for his jokes. His nephew Dale showed the wooden feet to the world. Dale Wallace shows the Press. The wooden feet match those that Green said were typical of Bigfoot at Bluff Creek. From the picture above, they clearly made the Blue Creek Mountain prints in 1967. They match the Sandbar Prints of 1958 as well. The outcry, of course, was caused by the fact that Patterson’s Bigfoot had feet that were inspired by Wallace’s fakes, especially noticeable in the curving toe line. And, worst of all, Wallace being to blame since 1958 meant that Patterson had gone to Bluff Creek to film something that had never been there to begin with. From the pictures it is unquestionable that the type of footprint that inspired the longest lasting interest in Bigfoot at Bluff Creek are the prints that Ray Wallace laid down. Removing Wallace and even the entire Bigfoot escapade at Bluff Creek does not abolish Bigfoot. It merely helps the Sasquatch to resurface and take precedence. Sasquatch was never a cone headed Yeti, nor did it have enlarged human feet. It is, actually, more than one thing– two tribes. One was human; one was not. Both remain remarkably nebulous even to this day because of all the shenanigans at Bluff Creek and the desire of the Bigfooters to create Bigfoot in the image of Yeti. There are two other entities. None were ever Sasquatch, but White Man, especially the Bigfooters, lumped them all together and added their features and attributes to Sasquatch. One is Dsonoqua. The other is Skoocoom. Skoocoom is 4 toed, if all the information is accurate. Like the Dsonoqua he may be a native American anthropoid. But the upshot of these series of articles is to impress upon the reader one thing undeniable, that “BIG FOOT” is not one thing nor do the events of Bluff Creek 1958-1967 form his image and footprints for us. This needs investigating again, and this is the purpose of Pacific Northwest & Siberia Expedition.